It's that time of the year again-the season to make merry at the German celebration, Oktoberfest. The first thing that comes to mind is likely beer, but why? Well, Oktoberfest is the celebration of autumn, the largest volksfest (or people's festival), and the harvest for the season's best beer. It's basically the celebration to celebrate, in other words! 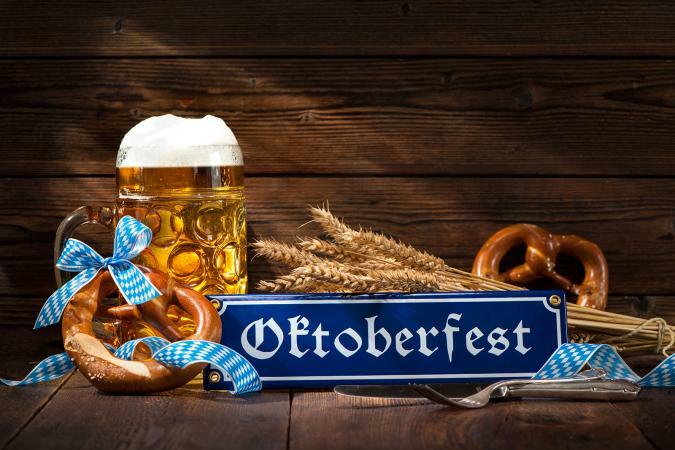 So grab your friends, family, Lederhosen, and prepare for a good time by fully embracing the month's events to the fullest. Absorbing the German culture isn't quite as fun without knowing one of their staple drinking songs (they tend to repeat the same handful every night, after all). You want to know what the heck they are saying for one of them or a chorus at the very least? A common song is called Hofbräuhaus-Lied, but all you really need to know is, "In München steht ein Hofbräuhaus-eins, zwei, g'suffa!" to fully get into this one (they'll sing it over 20 times a night, trust us). 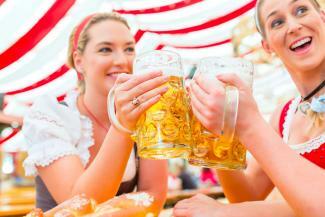 Get a jump on Oktoberfest by learning the lyrics like a native speaker! The Germans would be proud of your enthusiasm. Whether you are German or not, these babies are quintessential for Oktoberfest. Although this joyous celebration only rolls around once a year for roughly 30 to 50 days (depending on the location), why not wear that Lederhosen for the full duration? You don't have to celebrate at a German restaurant or culture center; you can bring the fun home too! 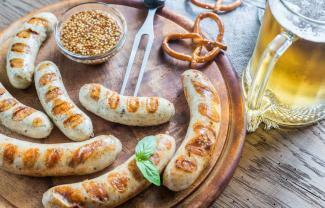 Make (or buy) some oversized pretzels with deli mustard, stock up on German beer, call some buddies, and bust out some classic Oktoberfest jams. Who wouldn't want to don the traditional Lederhosen for this nightly event? You might even stumble on some neighbors that want to join in on the fun! Okay, we all know that there are many types of bratwurst, sauerkraut, potato salad, apple strudel, pretzels, and everything in between, but have you tried them all? It's easy to head straight for the bratwurst while leaving many other tasty dishes behind, so you should make a list ensuring you've tried 'em all! Have you discovered currywurst (or bratwurst seasoned with curry)? What about spätzle (soft egg noodles)? If not, you definitely should because your taste buds are in for a real treat. Have I mentioned that many German restaurants also make some of the most amazing potato pancakes with applesauce? They do. Do some research, compile your list, and make it a point to try as much as you can during the season of Oktoberfest! Maybe you don't know how to officially Oom-Pah-Pah, but does it really matter? Rest assured, everyone is pretty much stomping around and making up the moves as they go. Sure, it can be a little embarrassing for you to jump up and slam your feet around like a sumo-wrestler preparing for a competition mere seconds away, but it seems to put a smile on everyone's face regardless. Oom-Pah-Pah is a form of traditional German music combined with Polka and consists of clarinet, accordion, and trombone instruments. Oom-pah-pah dancing is free-formed and usually includes jumping around to the beat (unless you're formally trained in German folk dancing). Everyone on the dance floor usually takes queues from the band to stomp around making easy for everyone to have fun looking ridiculous! In all reality, no one's judging your moves because they're all in the same boat (except for maybe the authentic German band). However, if you still feel insecure, there's always The Chicken Dance for you to join in on. There isn't a person out there that doesn't look goofy flapping their wings; let's be honest. If you're really daring, get it on video to look back and laugh about. Come on! What fun is taking down a Dos Equis or Bud Light at Oktoberfest? You can get those beers all year round at your grocery store, and they aren't German. Although their beers might seem difficult to pronounce (and they have umlauts all over the place making things all the more difficult), German beer is pretty fantastic. Give a Spaten, Bitburger, Hofbräu, Paulaner, or Warsteiner the ol' college try, and you'll be pleasantly surprised. By the way, a golden-hued pilsner, Oktoberfestbier (Octoberfest beer), a weissbier (white beer), or hefeweizen (wheat beer) aren't the only types of beer up for grabs. There might be a dunkel (dark beer) or doppelbock (double bock) available, and these deep, malty flavors should not be overlooked. Try a little of everything, stock them in your fridge, and have a beer tasting with friends at your home. You'll definitely see why the Germans are known for their Oktoberfests! Oktoberfest proves to be a crowd pleaser every year, whether you are German or don't have a drop of Germanic blood in you. The point of this event is to unwind and to get your silly on. Raise your glass to good times and simply enjoy the celebrations around you; maybe even go a little overboard! No judgment allowed.